The story of the Changi Murals really starts in 1921. Prior to that year, Changi was just a quiet little kampong (village) and rubber growing area on the north-eastern tip of Singapore Island. Events in England were about to change that once and for all. In 1921, the British Government instructed the Committee of Imperial Defence to determine where in the far east to locate a new naval base. This base was to have suitable facilities for the maintenance of a large battle fleet. At that time the battleship was still the “Queen” of the seas, and these ships projected British naval power. The base had to be close enough to the area of possible operations (Japan was even then considered to be a potential threat). After much deliberation, it was eventually decided to build the base in Singapore. Early in 1923 the site for the naval base was chosen after the examination of several sites, including one between Pulau Ubin and the western side of the Changi peninsula, and one on the south coast of Singapore Island. The decision was that the naval base would be constructed just east of the causeway connecting Singapore and Malaya. To provide local air defence, an RAF Station was be established at nearby Seletar. All that remained was the selection of sites for placing powerful coastal artillery batteries to defend against an attack from the sea, a land attack from the north having been discounted. Some fixed artillery defences already existed in Singapore. However, these dated from the 1914-1918 conflict and from long before then. In any case these guns only protected the Keppel Harbour area. The approaches to the new naval base were to all intents and purposes defenceless and new coastal artillery batteries were required to cover them. In February 1927, a Commission of three officers headed by Major General Sir Webb Gillman arrived in Singapore. They were to decide on coastal battery locations, and types and calibres of the guns. By the time they left for home, they had decided on locations for the main gun batteries. These were to be at Pasir Laba, Buona Vista, Tanjong Berlayer, Blakang Mati, Pulau Brani, Changi and Pulau Tekong Besar. These locations provided good protection for both the entrances to Singapore Harbour and to the new Naval Base. Gun batteries already existing at some of these locations would be upgraded. To provide a control system for the new defences, there were to be two Fire Commands, Faber and Changi. Faber Fire Command was to cover the southern and western approaches, and Changi Command to cover the eastern approaches. Despite the recommendations of General Gillman and his committee, it was to be many years before the new coastal artillery defences were ready for action. Changes of government in Britain brought postponement, renewed construction and postponement yet again. The Second World War in Europe war had started before defences were complete. Even then, defences against aircraft and an attack by land forces were poor in the extreme. Evidence that Singapore was vulnerable to an attack from the north was again ignored on several occasions. This came from Army Staff College Students in England and India, who examined Singapore's defence capability as part of their training, and also from a certain Lt. Col A.E. Percival, G.S.O. 1, HQ Malaya Command 1938-1939, who carried out an appreciation of Malaya’s and Singapore’s defences on behalf of the G.O.C., General Dobbie, of the defences of Malaya and Singapore. The gun defences to be constructed at Changi were to comprise a three gun, 15 inch (380mm) battery at Bee Hoe, and two 6 inch (152mm) batteries, each of two guns. One battery was to be sited on the hill (later renamed as Battery Hill) near Changi Village, and the other by the sea at Telok Paku. In addition, two Close Defence Batteries to counteract small craft were also to be constructed. To house the artillerymen and their support arms, two barracks, later to be named Roberts and Kitchener after two famous Generals , were constructed. Work on Changi was well under way by the end of 1927. A small standard gauge railway was also built to carry ammunition and stores for the guns. In 1930 the building of Changi was halted. The Labour Government in Britain headed by Ramsay McDonald, was struggling with the great depression that struck the world at that time. Defence expenditure, always a favourite target of the Labour Party suffered, and severe expenditure cuts were made, one of the casualties being Singapore, including Changi. In 1931, Japanese expansionism in Manchuria forced a rethink, and a new British National Government, still headed by McDonald, ordered that work on Singapore’s defences be resumed. In 1932 came the decision to complete Changi, and construction work recommenced in 1933. Changi would now continue to grow until 1941. In 1936 Changi received its first guns. Two Mark VII 6-Inch guns with a magazine between them were emplaced on Battery Hill and named the Changi Battery. The location was under the present day radar units. Close by was the artillery control centre for the whole Changi Fire Command. At the same time the two 6-Inch guns of the Beting Kusah Battery were emplaced at Telok Paku. The emplacement is now under the north east of the airport. The main 15-Inch Battery was still under construction, and was completed in 1938. This battery was named the Johore Battery. All that remains of the Johore Battery today are the magazines of the No.1 Gun in Cosford Road, although there is a chance that the Magazine of the No.2 Gun still exists underground on prison property. A Replica 15-Inch Gun has been placed on the site of the original. The replica on Google Earth. Just north of the Beting Kusah Battery the Changi Inner (or School) Close Defence Battery was built. This is also under the airport now. A second Close Defence Battery, Changi Outer (or Palm), was built at the mouth of Changi Creek. These batteries were were armed with Twin 6 Pounder Guns. Some remainders of the Changi Outer Battery can still be seen on each side of the swimming pool at Netheravon Road The location on Goggle Earth. By 1941 the work at Changi and at other locations in Singapore was complete. As well as Roberts and Kitchener Barracks additional accommodation called India Lines was completed to provide accommodation for anti-aircraft gunners, the need for such defences having finally been appreciated and acted on. Selarang Barracks had also been built between 1936 and 1938. The 2nd Battalion, the Gordon Highlanders taking up residence there. I would suggest that the coastal batteries built in Singapore did their work effectively without firing a shot. The Japanese knew all about them and planned accordingly. On 7th December 1941, a little less than an hour before their attack on Pearl Harbor, the Japanese landed in the north of Malaya at Kota Bahru. Other landings took place at Signora and Patani in southern Thailand. The Changi Garrison sat and waited, there was not much else for them to do. Apart from a couple bombing raids, which caused some damage in Changi Village, the war did not come to Changi until February 1942. Then the Japanese, just over the Straits, then let loose their artillery and aircraft on the area. There was heavy bombing and shelling, and buildings were destroyed and damaged. The artillery magazine being one of the buildings damaged. Electricity and water supplies were cut. Despite the damage, the garrison with the nearby 3rd Indian Corps and other Fortress troops was still strong and ready to give a good account of itself should the Japanese attempt a landing in the Changi area. On the evening of 7th February, the Japanese 5th Imperial Guards made a feint attack on Pulau Ubin. The Changi 6-Inch guns, and guns from Pulau Tekong fired on them, but because of being poorly supplied with high explosive ammunition, the effect was not as good as it might have been. The main Japanese assault on Singapore began on the 8th February with a landing at Sarimbun on the western side of the island. Changi was the subject of an artillery barrage on that day and its guns replied with great intensity. 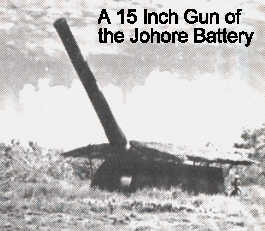 The 15-Inch guns of the Johore Battery later fired on Japanese forces at Tengah airfield on the other side of the island. Being coastal artillery, they were well supplied with armour piercing ammunition, but had no high explosive shells at all. There was only one 15-Inch High Explosive shell on Singapore, and this was taken to the Johore Battery. Armour Piercing ammunition would bury itself deep in the ground before exploding rendering it pretty well ineffective against troops. By the 12th February the situation in Singapore was desperate and Lt. General Percival ordered the Changi garrison to withdraw to Singapore town. Fortress Changi’s role in the defence of Singapore was over. Before they withdrew, the Engineers blew up the guns which had been Changi’s “raison d’etre”. The 15-Inch guns had fired 194 rounds of armour piercing ammunition at the Japanese forces. Not one single round was fired against a naval target by the guns of Changi and Pulau Tekong. At 1715 hrs on the 15th February, a humiliated Lt. General Percival made his historic walk along the short approach road to the Ford Factory at Bukit Timah. 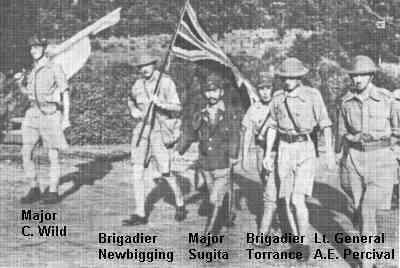 He was accompanied by Major Wild, Brigadier Newbigging and Brigadier Torrance. At the factory, the victorious Japanese Commander, Lt. General Tomoyuki Yamashita, was waiting to accept the surrender of Singapore. The surrender document was signed at 1810 hrs. The paper fortress had collapsed untested by an assault from the sea, and over 80,000 troops went into captivity. It was Britain's greatest defeat, and Percival was made the scapegoat. After the war, he was shunned by Ministry of Defence and an ungrateful Labour Government, and retired from the army. His old regiment, The Cheshire Regiment favoured him by appointing him as the Colonel of the Regiment, an honorary title. With the release of classified documents the truth about the the preparations for, and the war in Singapore have emerged. Far too late for Percival who died in January 1966. Changi was selected by the Japanese as a POW camp area. 15,000 Australians went in to Selarang Barracks which had been built to hold but a battalion of infantry, and 35,000 British went to Roberts Barracks, Kitchener Barracks and India Lines. They were later joined by Dutch POWs captured in The Dutch East Indies (Indonesia). 3,500 civilians were interned at Changi Prison. Two weeks after the prisoners arrived in Changi, Roberts Barracks was designated as the hospital area. One block was taken over as the operating theatre, another became the isolation ward and blocks 144 and 151 became the dysentery wards. Despite the size of the hospital area, it was too small to cope with the medical needs of all the prisoners, as indeed was the rest of the Changi area. Battle wounds and the growing shortage of food coupled with few medical resources and major sanitary problems meant that health rapidly declined. It was to Roberts Barracks, that Bombardier Stanley Warren would arrive.